It annoys some students, because they don't get "it," but I actually assign a "Project Runway" type project in Art History. They spend all semester studying a specific artist of their choice, at the end of the semester they have to create an illustration of a fashion design, as if it was created by their artist. An interpretation of that artists thoughts and techniques, applied in a very different medium. Thank you Mattel and Barbie for providing me with a bang up example to show the students. Hey guys THIS is why you need to be able to make these mental leaps. THIS is why you study art history, so that when you are creative director for some company you can push for cool projects like this! BTW I LOVE the Klimt doll, but I think the van Gogh dress really takes it to the next level!! Look at the details, the shoes! Article at If Its Hip Its Here Mattel Releases New Fine Art Dolls. 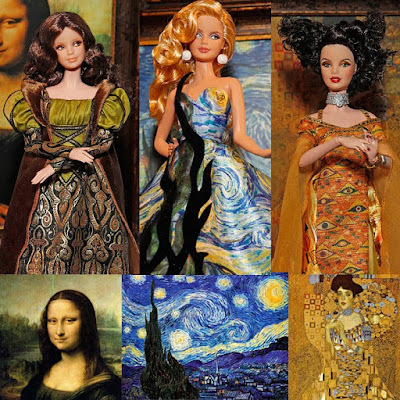 The DaVinci, Van Gogh & Klimt Barbies.